Gene Monahan (born 1945) is the former head athletic trainer for the New York Yankees of Major League Baseball. He spent almost 50 years with the Yankees organization and from 1973 until 2011 was part of their training staff. During his tenure Monahan cared for the players on seven World Championship teams, 11 Pennant winning teams and 19 post-season teams. Monahan grew up the oldest of eight children. He is a huge racing fan. Monahan graduated from Indiana University in 1969 with a bachelor's degree in physical education. Monahan's connection to the Yankees began when was hired as a batboy in 1962. For ten years, he worked as a trainer and clubhouse attendant in the minor leagues. In 1973, after George Steinbrenner purchased the team, he was hired as an athletic trainer. For the better part of the next 39 seasons, Monahan was entrusted to care for and tend to the injuries of players from Reggie Jackson to Derek Jeter. During his time with the team, they won seven World Series Championships, (1977, 1978, 1996, 1998, 1999, 2000, and 2009). ↑ O'Connor, Ian (April 13, 2010). "Ailing Monahan positive about prognosis". ESPN News. Retrieved June 26, 2010. ↑ Borelli, Stephen (September 9, 2011). "Longtime Yankees trainer Gene Monahan retires". USA Today. 1 2 Madden, Bill (April 13, 2010). 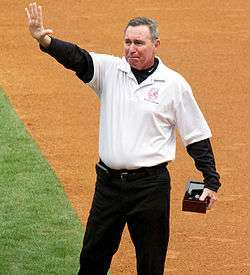 "As New York Yankees trainer Gene Monahan battles cancer, Bombers bestow him with World Series ring". New York Daily News. Retrieved June 26, 2010. ↑ Gonzalez, Alden (December 15, 2010). "Yankees trainers honored as best in baseball". mlb.com. Retrieved December 15, 2010. ↑ Hoch, Bryan (May 11, 2011). "Trainer Monahan to retire at season's end: Longest-tenured member of Yankees joined team in 1962". mlb.com. Retrieved May 11, 2011. ↑ Bernstein, Vic (August 19, 2012). "A Yankees Lifer in Nascar Land". The New York Times. Retrieved August 28, 2012.